Note: Blogs post things in reverse chronological order (google it) so if you want to read these chapters in order, scroll down and read from Part 1. During the down year, I'd taken the off year and used it to prepare my truck, CON KSO. So not only was I primed to wring every ounce of fun out of old Mexico, I was also physically prepared for the challenge. Undoubtedly, there are some gear heads out there who will want me to elaborate specifically on the Baja mods I've added to CON KSO, to you I say, pay attention. As this story unfolds I will give specifics. As a teaser, however, I will give you CON KSO's vital statistics: 2007 Toyota Tundra extended cab 4x4, 5.8L V8 with a steel welded frame Callen Camper and, here's what makes her so special, an 8' bed. Remember when a standard bed was 8' long? CON KSO is a unicorn of California Tundras- an almost impossible to find combination of bed length, cab configuration and 4x4 drivetrain- my ol' girl, CON KSO. 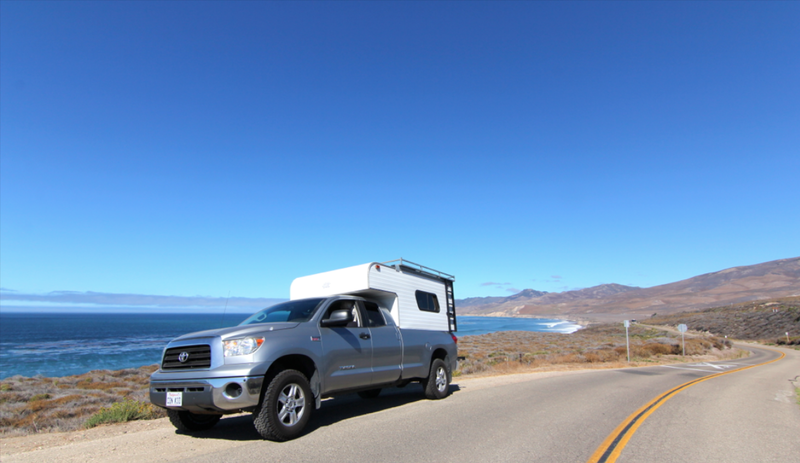 CON KSO: Jalama Beach cruising. When you reach this turnout, you are on the verge of what I call "real Baja" the good stuff is coming real soon. 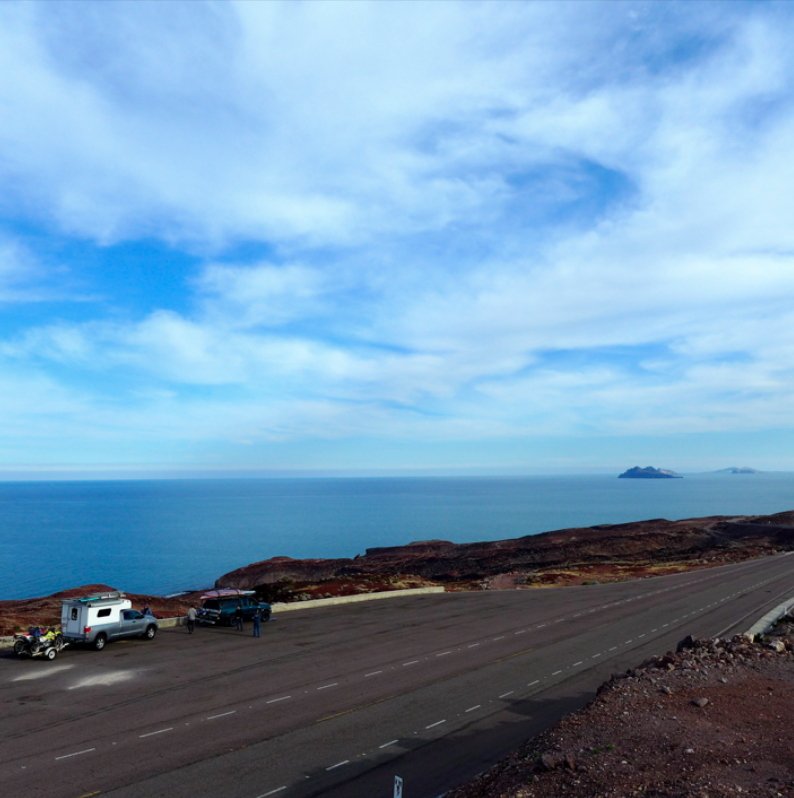 This is the Sea of Cortez outside of San Felipe. 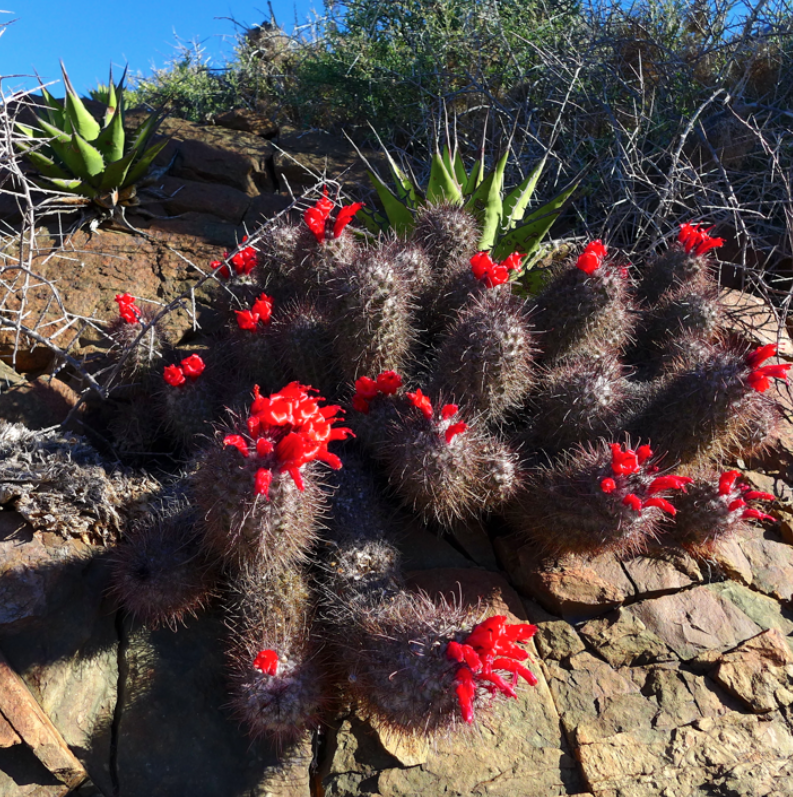 We like to take this route instead of the Pacific side western route that runs you through the dreary agricultural areas (also strewn with plastic trash and big, slow, stinky, time-sapping diesel trucks) that stretch from the border to San Quentin. Our route, while a bit longer, is a million times more scenic and tranquil and is almost completely devoid of truck traffic. Plus, the first night puts you in a campsite surrounded by pristine desert wilderness. 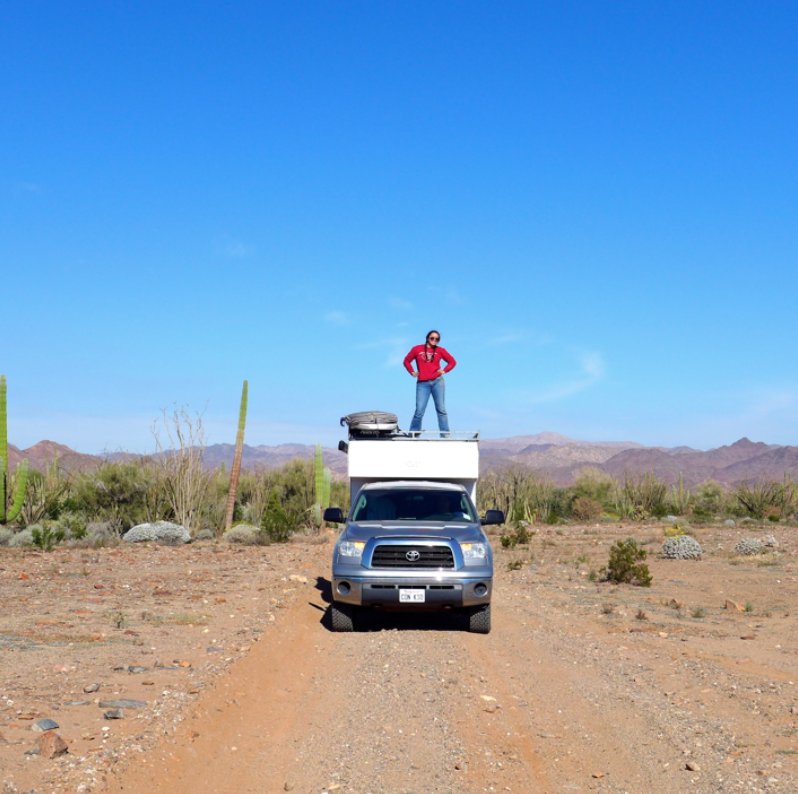 Truck surfing under the big, blue, Baja sky- Dakotah, going for it. The road starts to look like this as you get further and further south from San Felipe. 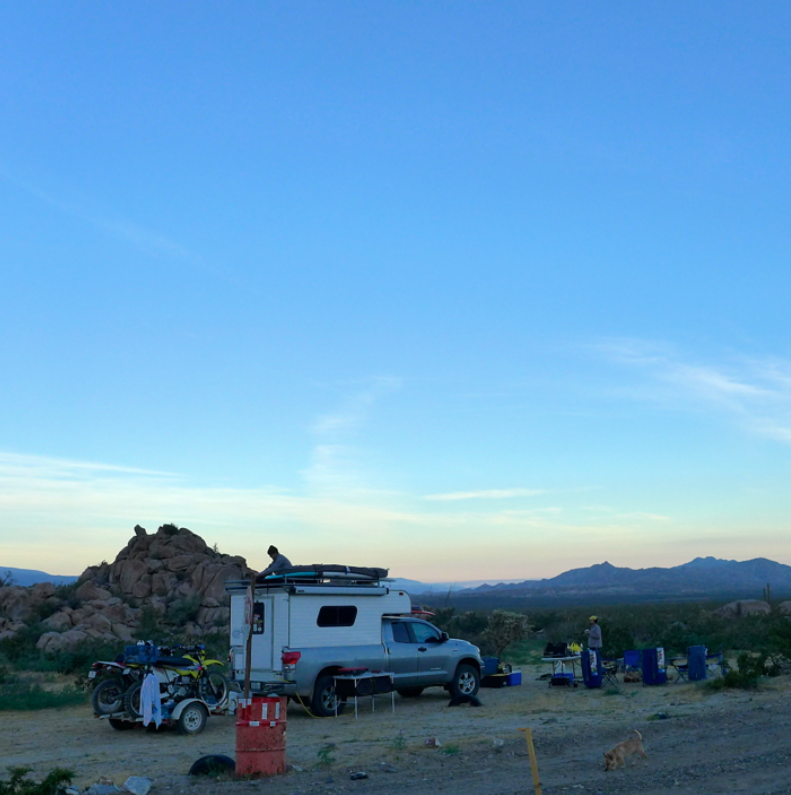 Baja camp #1 about ten hours into northern Baja- a beautiful stretch of desert. This is our first day's stop along the trail- it's a moto rider's paradise with trails snaking out into the desert in every direction. We were a caravan of two vehicles each of us bringing motorcycles. 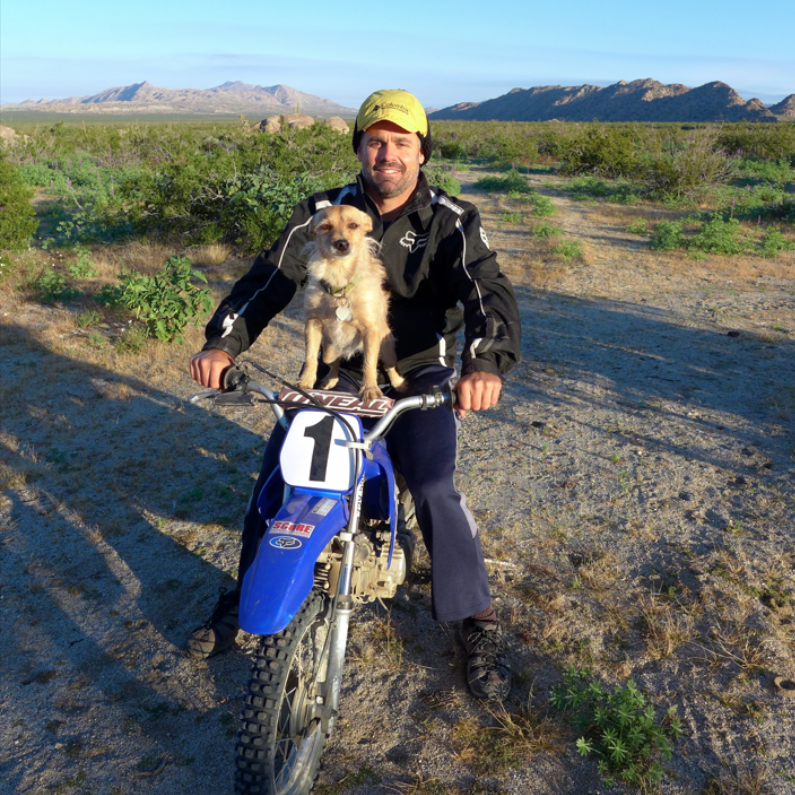 Here's Matt and Vida off on their little 90cc moto for the morning bathroom run. Motos are great to have in Baja just be prepared to repair thorn punctures. 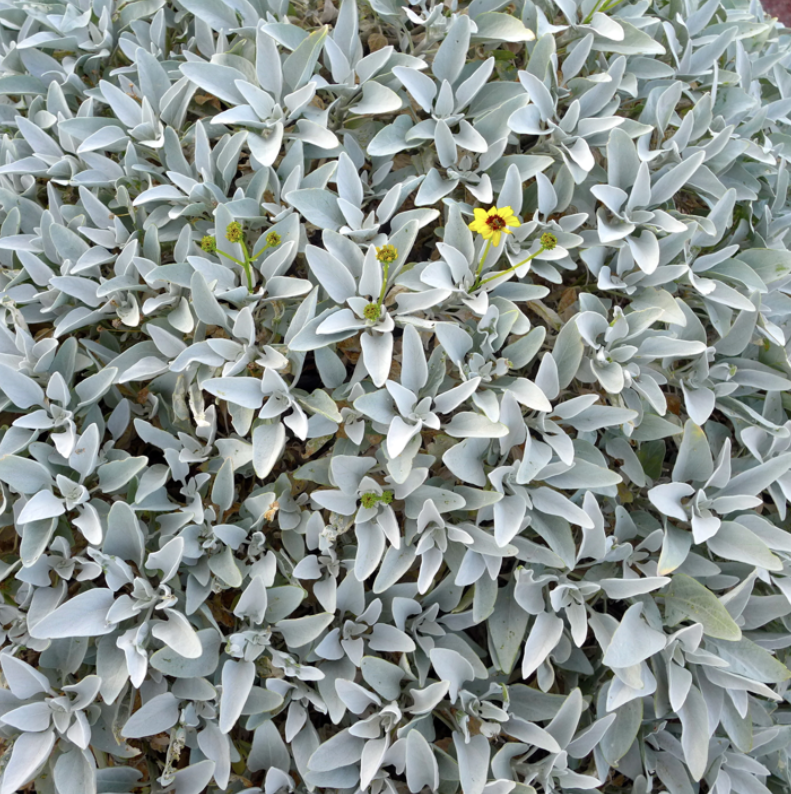 Look how green the desert is- there were more blooms than I've ever seen down there. We spent a nice chilly night under those bright Baja stars happy to be around a small, friendly camp fire wondering what the next day would bring. We had decided to take the path less traveled and test ourselves on a 4x4 trail that cuts through a canyon that we were told held water so sweet and pure that you could scoop it up and drink it right from the ground. I closed my eyes both excited to check that out and nervous about the desolation of the road- help would be a long way away.